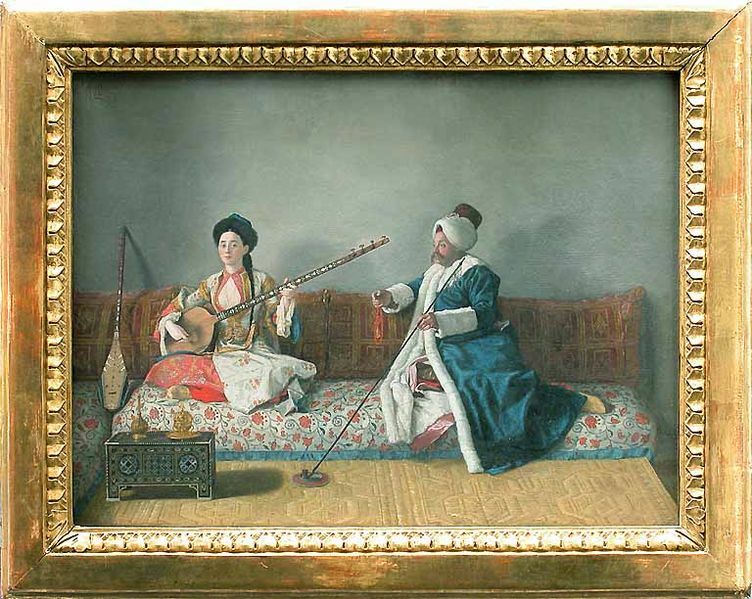 I am enjoying right now a new book I received published by The Vendome Press which explores the elaborate style of Orientalism. 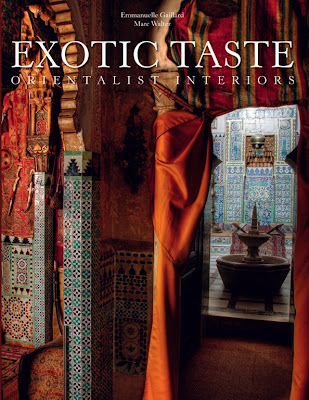 Exotic Taste: Orientalist Interiors by Emmanuelle Gaillard is a big, gorgeous tome which illustrates how the art and style of the East affected the decorating, architecture, and fashion of the West. The book inspires the reader to reach beyond what is familiar with exotic elements. I have never been to Asia, though I would love to go. Some day, I hope. I love Asian things. My mother gave me a tall, brown, glossy Asian vase, probably in 1982, which I cherish. 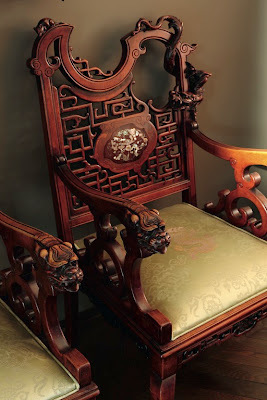 As I have said here on the blog before, my great aunt Milly lived in the Philippines and brought back a lot of Asian objects to 611 so they have always appealed to me and felt like home to me. 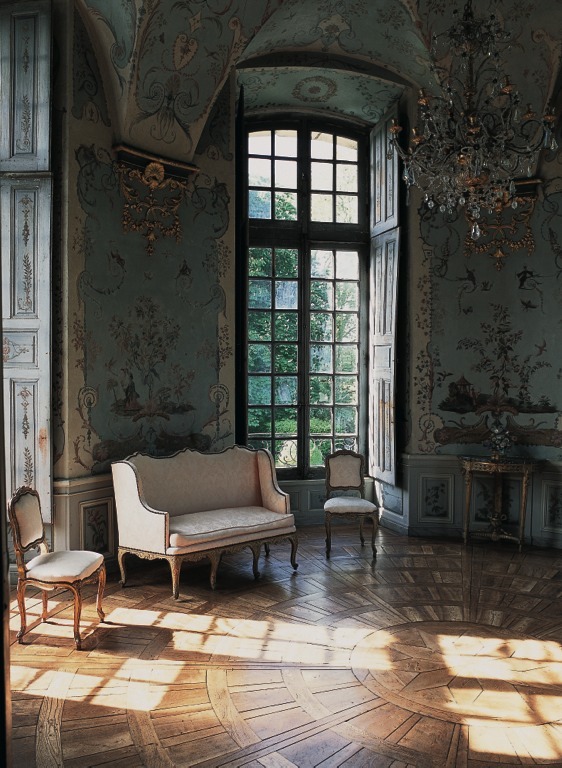 In the eighteenth century, this book says, European designers and architects turned away from the rigors of classicism which was popular at the time in search of something more romantic, sensual and pleasurable. 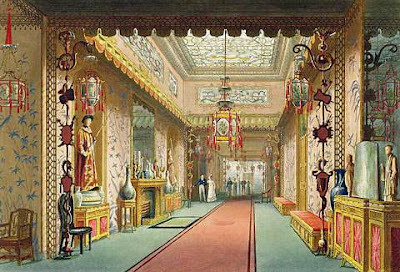 As a yearning for the exotic grew in Europe, Chinese salons, Turkish boudoirs and Persian bedchambers appeared in interiors. 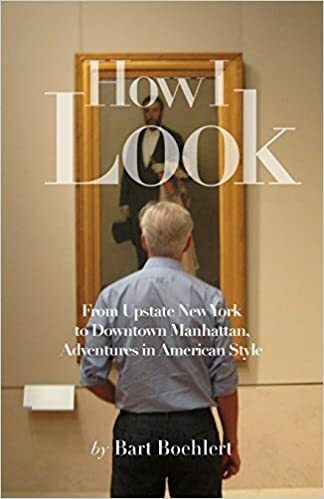 What is interesting to see in this book is how Europeans interpreted Asian styles for their own use. 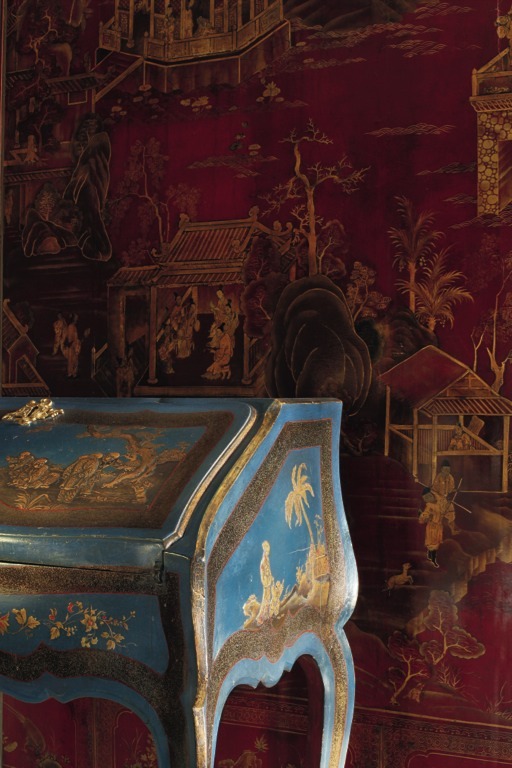 At the Chateau de Haroue in Lorraine, France, artist Jean Pillement painted birds, insects, animals and pagodas on chinoiserie panels in an elegant composition of pale colors. It's Marie Antoinette meets the Empress Dowager. Similar pale tones show up in England at the Royal Pavilion, residence of George, Prince of Wales, in Brighton. The Long Gallery designed by Frederick Grace is decorated in shades of blue, pink and red. It's a dreamy palette. A stronger contrast of blue and red is apparent in the blue lacquer desk owned by Madame de Pompadour in front of a red panel at the Musee des Arts Decortifs in Paris. Gold is the common denominator here. This torchere designed by the firm Christolfe in 1874 is made of cloisonne enamel and gilt and patinated bronze. What fantastic detail. From 1800, this pair of carved wood chairs with a mother-of-pearl inlay is attributed to Gabriel Viardot. Such an unusual, imaginative shape. 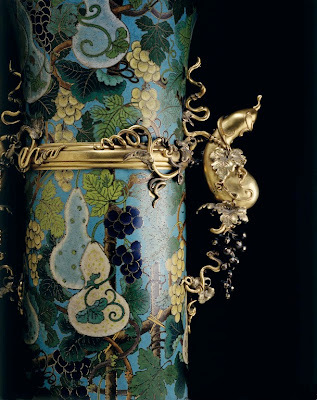 The Eastern style influenced fashion too. 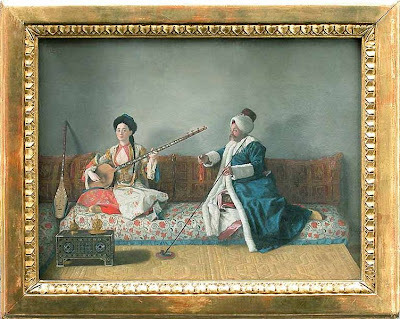 Here are Monseiur Levett and Mademoiselle Giavan in Turkish Costume, painted by Jean-Etienne Liotard in 1740. The low bed is covered in a pretty pale floral fabric. Why does this painting make me think of Diana Vreeland? Kashmiri shawls woven from the woolly fleece of Tibetan goats became popular in Europe, and soon Scottish mills produced imitations of the imported shawls. 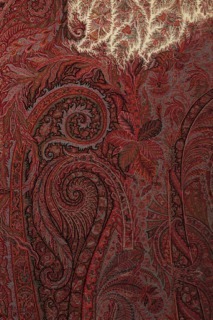 The Scottish mill town of Paisley created exact replicas of Kashmiri shawls, and gave its name to the classic pattern. 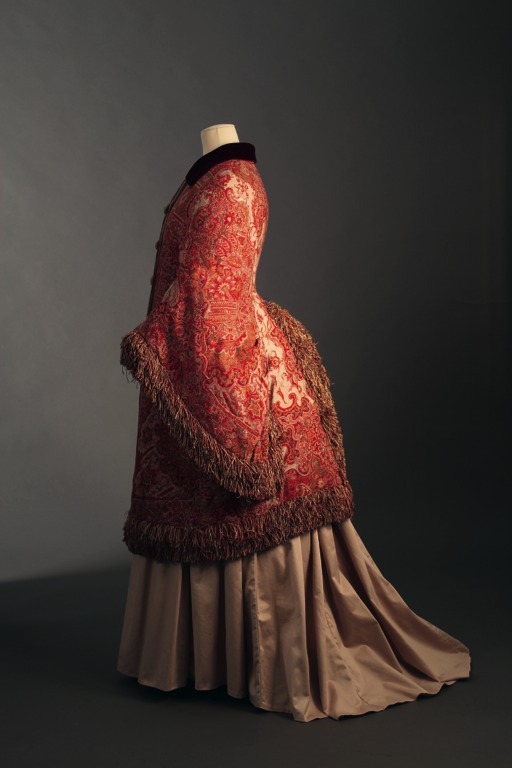 This long cashmere paisley shawl is from 1870-75. I like having paisley around me, whether in a challis wool Etro scarf or pillow covers in the living room. Paisley adds a romantic, timeless element. I recently got some paisley cocktail napkins inspired by a print by William Morris, and I love what they add to the table. Exotic Taste encourages the reader to consider the beauty of Asia and bring some of it home.